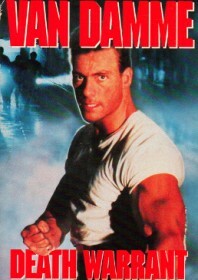 Van Damme plays a maverick cop sent undercover to suss out a deadly mystery occurring at the Harrison Penitentiary, where two-bit stereotypes are dropping like flies with ice picks shoved in their skulls. It’s not a particularly pleasant place, but if there is anyone who can sort the men from the boys then it’s prancing ballet dancer Jean-Claude Van Damme, who quickly sets to work beating up the inmates in his own jumping, kicking style. This action film is watchable enough but still can’t escape that made for TV feel despite the gross out violence, and Van Damme isn’t too bad, left slightly wanting in places but nevertheless aptly equipped for this sort of nonsense.